Great tasting nutrition to help your adult cat control hairball formation. We know that some cats are prone to hairballs and that's why we've create a formula with natural fibres blend to help control hairballs and dietary fibres to help support digestive health. 100% Complete and Balanced with the great taste of delicious real chicken - it is everything your adult cat needs! 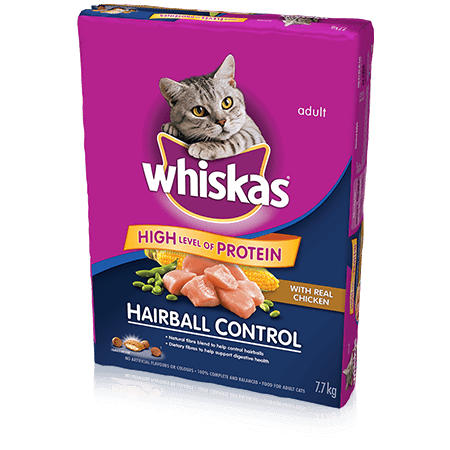 WHISKAS ® Dry Cat Food Hairball Control With Real Chicken, 7.7kg is rated 4.3 out of 5 by 72. Rated 5 out of 5 by Sunshine from Great Cat food for my long haired cats I purchase this item very often - I have two cats - Sunshine and Roc - I adopted them a year ago - they are now 4 years old. I wished I could get some coupons for this dry food, as pet food is not cheap and I am a senior, living on a fixed income. Thanks. Rated 5 out of 5 by PJP56 from A happy discovery: Whiskas Hairball Control We got a half a bag of the Whiskas Hairball Control from a friend, for our cat Jam the Dude, an older gent, a couple months ago, and he liked it right away, even more than his wet food. He's a fastidious guy, who constantly cleans himself, and , yup! , regularly found that his body would reject that much ingested fur, hack dramatically, and promptly get kicked outside, before he threw up on the carpet. He's not had ANY episodes like that since we started feeding him the hairball control Whiskas. I suspect he likes that fact as much as we do. We bought a new, larger bag for him today at the store, and will continue to do so. Rated 5 out of 5 by Cassini from Happy Hairball Free I got my 9yo Smokey as a rescue from a home he had to leave. He is a funny long haired tabby who LOVES to groom himself. He is almost neurotic about it. He was having issues with previous regurgitation issues until I tried this food. As I also now monitor his intake, not a single hairball in a month! I would recommend this product for any long haired cat owners, wether they self groom or groom the whole cat clan! Love it! Rated 5 out of 5 by JADEBAB_344976005 from My cat has in the past had some problem with hairballs but with this new whiskers dry hairball formula we've had absolutely no more problems related to hairballs. She comes running when the dish gets filled. Fantastic product and I wish I would have tried it sooner! We will definitely be using this again! Rated 4 out of 5 by MAVISBNB_344852329 from I have always purchased food for my cat from a pet store; although I have always purchased Whiskas cat treats at the grocery store and my cat enjoys them much. When I fed my cat the Whiskas Dry Hairball formula, she absolutely loved it. It was as though I had given her a whole bowl of treats to eat but I knew that she was indeed eating a good quality cat food made from real chicken. Rated 5 out of 5 by SHERIBON_344877541 from My two cats just love this food! I like it because of the hairball formulation that does seem to help cut down on the hairballs. I have one short haired cat who continually washes the long hair cat so gets a lot of hairballs. She also does not like the hairball medicine in a tube so I am always on the lookout for other solutions. Rated 1 out of 5 by Gillibean from My cat hates it I’ve fed my cat Whiskas forever. Since she was a kitten. She loves Whiskas. But for some reason she will not touch the hairball formula. She does get hairballs and has coughing fits but she doesn’t even want to try this new food. Is there a difference between this and the meaty selections? CHICKEN BY-PRODUCT MEAL, GROUND YELLOW CORN, CORN GLUTEN MEAL, ANIMAL FAT (PRESERVED WITH BHA AND CITRIC ACID), SOYBEAN MEAL, NATURAL FLAVOUR, CHICKEN, POWDERED CELLULOSE, BEET PULP, WHEAT FLOUR, RICE, SALT, CARAMEL, POTASSIUM CHLORIDE, VITAMINS (CHOLINE CHLORIDE, VITAMIN E SUPPLEMENT, VITAMIN A SUPPLEMENT, NIACIN, VITAMIN B12 SUPPLEMENT, RIBOFLAVIN SUPPLEMENT [VITAMIN B2], THIAMINE MONONITRATE [VITAMIN B1], d-CALCIUM PANTOTHENATE, VITAMIN D3 SUPPLEMENT, BIOTIN, FOLIC ACID, PYRIDOXINE HYDROCHLORIDE [VITAMIN B6]), TAURINE, dl-METHIONINE, TRACE MINERALS (ZINC SULPHATE, COPPER SULPHATE, MANGANESE SULPHATE, POTASSIUM IODIDE), CALCIUM CARBONATE, BHA, BHT. WHISKAS® Hairball Control with Real Chicken Dry Food Formula is formulated to meet the nutritional levels established by the AAFCO Cat Food Nutrient Profiles for adult maintenance.